The CROZZ's C-shaped LED daytime running lights and controllable LED headlights form a front end with electronic moving 'eyes' that can communicate with other road users, VW says. SHANGHAI -- Volkswagen's CROZZ concept previews a full-electric crossover that will be the third member of the brand's new family of purpose-built battery-powered vehicles. The CROZZ will go into production in 2020, VW brand boss Herbert Diess said the the concept's debut at the auto show on Wednesday. "By 2025, we want to boost annual sales of electric vehicles to 1 million units. The I.D. CROZZ will play a key role in that," Diess said in a statement. The awd CROZZ has a drivetrain that makes 302 hp. Its top speed is 180 kph (112 mph) and its range is 500 km (311 miles) on the New European Driving Cycle. Its battery can be charged to 80 percent of its energy capacity in 30 minutes using a fast-charging system, VW said. 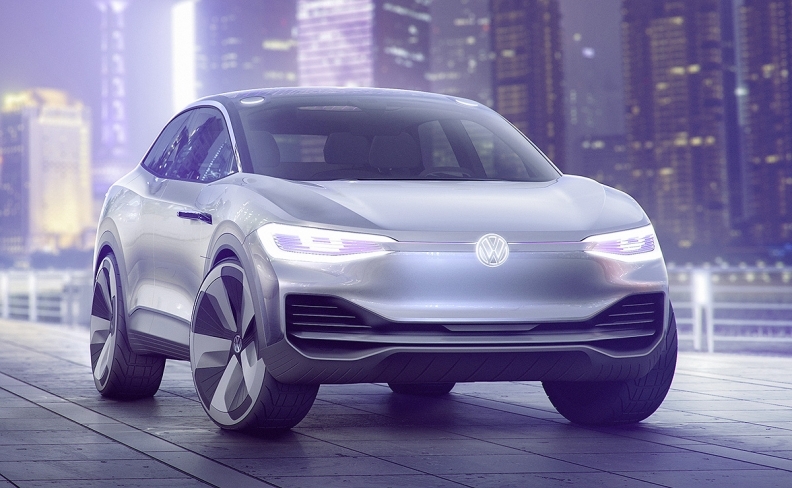 The concept has an autopilot function that switches to fully autonomous mode when the driver touches the VW badge on the steering wheel for three seconds. VW did not say if this will make it into production. VW aims to have the first of its I.D. electric cars on sale in 2020 to achieve CO2 reduction targets in Europe and China. The brand has so far shown two other I.D. concepts at auto shows, the I.D. hatchback at the Paris show last October and the I.D. BUZZ minivan in January at the Detroit show.